Sacred Reterritorialization: The Latino Theater Company's “La Virgen de Guadalupe, Dios Inantzín"
total command of the space and who we are” (1). The Latino Theater Company’s annual production of La Virgen de Guadalupe, Dios Inantzín stages the impulse to re-enact history and reclaim Latina/o space in Los Angeles. A large-scale performance of theater, music, and dance, adapted from Evelina Fernandez’ play, “Nican Mopohua” (2) and directed by Jose Luis Valenzuela, this piece stages the four apparitions of La Virgen de Guadalupe that were witnessed by Juan Diego in 1531. The production boasts a cast of over 120 performers, including 20 children and 53 dancers, the bulk of who are local community members, with only nine professional actors and musicians. 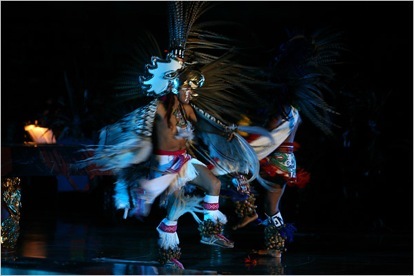 It is performed entirely in Spanish and Nahuatl, the indigenous language of Central Mexico. The production has become a holiday tradition since its initial performance in 2001 and continues to be performed free of charge, attracting audiences of close to 7,000 people over the course of its two-night run before the feast day of Our Lady of Guadalupe on December 12th (3). Staged within the Cathedral of Our Lady of the Angels in downtown Los Angeles, an area which bears traces of the dislocation of the once-central Mexican population of Los Angeles, the production succeeds in actively staking a claim for Latina/o centrality and visibility within the city and the Church (4). This community performance that re-enacts historical/mythical events by incorporating both ritualistic and liturgical elements requires critical strategies that can map how the historical and mythical become lodged within cultural memory. Diana Taylor’s The Archive and the Repertoire: Performing Cultural Memory in the Americas provides vital critical paradigms from which to understand the complex relationship between epistemologies of knowing and embodied knowledge. In particular, her paradigm of the archive and the repertoire as well as her notion of scenarios as meaning-making paradigms allow for a nuanced understanding of performances, such as this one, which stage the historical and the mythical as an act of reterritorialization in the present. In the case of La Virgen de Guadalupe, Dios Inantzín, I argue that the production subverts, from within, not only the scenario of conversion but also the power of the Catholic church as well as the civic power of the City of Los Angeles, all the while foregrounding the centrality of Los Angeles’ Latina/o population. While the narrative of La Virgen de Guadalupe, Dios Inantzín tells the story of the apparitions of La Virgen de Guadalupe to Juan Diego, it is undeniably linked to the history of the conquest in Mexico and therefore utilizes the scenarios of conquest and conversion as one of its central dramatic elements. Prior to the start of the play’s narrative, the forced baptisms of the Aztecs are staged in silence which provides far more than contextualization. Calling upon Diana Taylor’s articulation of how scenarios can be used as meaning-making paradigms, I focus on how the physical location of this performance and the role of its social actors and the audience, factor into the relationship between performance and reterritorialization. Essential to recalling and reactivating a scenario of conquest and conversion in this case, is to invoke its physical location. As Taylor argues, “scene and scenario, stand in metonymic relationship: the place allows us to think about the possibilities of the action” (5). In this particular performance, the location is linked to two historical moments, the colonization of Mexico and the early urban development of Los Angeles, and furthermore actively works to reterritorialize the space of the church as a means to combat both histories of erasure and displacement. As the “model church for all parish churches” in Los Angeles, the cathedral is an archive of Roman Catholic ideology. When the Catholic symbols and archival materials within the cathedral,(i.e. the crucifix, the altar, stained glass windows, tabernacle…etc) are juxtaposed with recreations of the forced baptisms of the Aztec population, indigenous ritual dances and acts of worship; the violent imposition of Catholicism cannot be denied, and its role as the singular, and true faith is called into question, particularly when Nahuatl takes the place of the traditional classical language of the Church, Latin, or of its colonial heritage, Spanish. 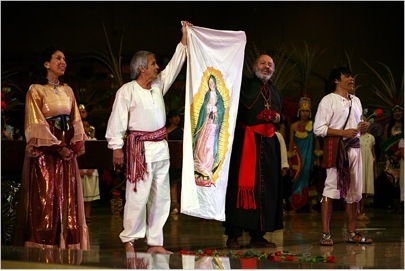 Additionally, the fact that devotion to La Virgen de Guadalupe became a tool of conversion for the Spanish to circumvent the traditional religious practices of Mexico’s indigenous population, lends even more power to the performance in the Cathedral as La Virgen de Guadalupe, Dios Inatzin is being performed as a means to remember, value and even reclaim indigenous practices for Catholic Latinas/os today. In order to more fully restore the indigenous culture that the account of the apparitions of La Virgen de Guadalupe was deployed to overwrite, The Latino Theatre Company’s production emphasizes the doubling and replication inherent within the image of the Virgen herself throughout its performance and even in the full title of its work, which pairs La Virgen with Tonantzin: La Virgen de Guadalupe, Dios Inantzín (6). The performance foregrounds how the story of La Virgen’s appearance is based on the indigenous account of her apparitions by including full recreations of Aztec rituals and dances within the cathedral, and most impressive, utilizing the altar, the most sacred space of the church (7). Indeed, while the performance stages the effects of the obliteration of indigenous practices by the colonial Spaniards, it also stages, in the present, a reterritorialization of the sacred space of the Catholic Church as a space where indigenous practices are privileged. For example, following the recreation of traditional Aztec blessings at the start of the performance, the danzantes encircled the altar as the Virgen appears dressed in Aztec regalia and is raised up by the dancers on a platform. In addition, at various times throughout the performance, danzantes encircle the altar to perform traditional dances and rituals. Certainly, the unapologetic centrality of indigenous ritualistic and religious practices surrounding the altar illuminates the production’s aim to symbolically reclaim the sacred spaces that were demolished by the Spanish in their conquest of Mexico, while also acknowledging the duality of Mexico’s most revered icon of nationhood, who within the U.S. and beyond has become the Empress of the Americas and protector of the downtrodden. While the location of the performance plays a crucial role in its success as an act of reterritorialization, it would not even be a possibility without the live bodies of the Los Angeles Latina/o community itself, both the actors and the audience. The performance begins by highlighting the central role of the chorus of extras, singers and dancers who open the show with a staple of Guadalupe celebrations, the song “Buenos Dias Paloma Blanca” (Good Morning White Dove). This is followed by two rituals in which danzantes, Mexican folk dancers, first honor the four directions: East, North, West and South, and, then, in stark contrast to the song to the Catholic Virgin, perform a dance to honor the Aztec Goddess, Tonantzín. The role of the chorus and dancers is vital to the performance as they not only represent the indigenous peoples of Mexico within the play’s narrative, but they are also performing the Los Angeles Latina/o community itself. As Taylor argues, “in scenarios, viewers need to deal with the embodiment of the social actors. [And] the scenario requires us to wrestle with the social construction of bodies in particular contexts” (8). 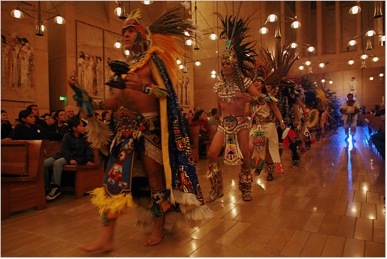 In this performance, the bulk of the actors are in fact local community members and children; and their embodiment of the indigenous peoples of Mexico, while simultaneously marked as the local community within the Los Angeles Cathedral, creates a multi-layered reading of their bodies across both time and space. As their performances of dances, rituals and historic events work to reclaim the space of the Roman Catholic church, they make for some unavoidable parallels to histories of displacement within the vortex of civic power that is downtown Los Angeles. Furthermore, the audience, which is predominately made up of thousands of Latinas/os, not only bears witness to this reterritorialization but must also situate themselves in relationship to it. One of the most interesting aspects of this performance is that it at once works to reclaim sacred space, while also functioning as a vehicle by which the Latina/o community can not only critique civic power but also reclaim it. Located in the heart of Downtown Los Angeles, the Cathedral of Our Lady of the Angles constitutes an archive not only of Catholicism itself but also of Los Angeles history; its architecture displays the economic and municipal power of the Catholic Church, as do its presiding officials, such as Cardinal Mahoney. The stone walls suggest endurance and power, as does its immense size. Its location is at the heart of municipal Los Angeles, not far from major public offices including: Los Angeles City Hall, Federal, State and County Courthouses, Hall of Records, Department of Water and Power and Alameda Street Detention Center, juxtaposes the power of the Catholic Church alongside that of the City of Los Angels. Throughout the history of Los Angeles, powerful mechanisms of dominant society have succeeded in physically and symbolically relegating various minority groups, but primarily Mexican an/d Latinas/os, into the periphery of the metropolitan social order and public imaginary. Periods of transformation such as the expansion of the downtown railroad during the 1910s and 1920s, mass deportations of both Mexicans and Mexican-Americans during the Great Depression in the 1930s, large-scale urban highway construction through eastside barrios in the 1950s, and the displacement of the residents of Chavez Ravine to make way for Dodger Stadium in the late 1950s were cloaked in a rhetoric of urban renewal. Yet as revealed by Raúl Villa in Aquí estamos y no nos vamos: Place Struggles in Latino Los Angeles, the dislocations actually functioned as acts of urban removal (9). 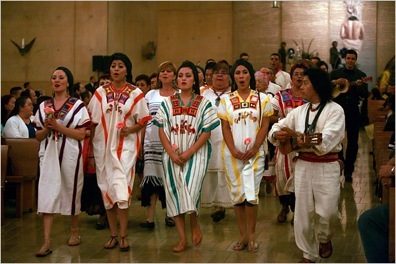 Consequently, I argue that the yearly pilgrimage of thousands of Latinas/os to the Latino Theater Company’s performance within the Cathedral of Our Lady of the Angels, constitutes a performance of the symbolic reterritorialization of the downtown area. Furthermore, Cardinal Mahoney spoke of the significance of having this production staged within the cathedral, given that cathedrals had traditionally been used as sites where dances and songs were performed in order to preserve cultural traditions. Ultimately, as I have argued, the setting of the play within the cathedral plays a critical role within the dynamics of the performance as the cathedral acts as an archive of both Catholicism and Los Angeles history, whose meaning is radically altered by the embodied performances of indigenous narratives and rituals within its walls. In the end, the continued success of the Latino Theater Company’s annual production within the Cathedral of Our Lady of the Angels is based not only on the widespread appeal and devotion to La Virgen de Guadalupe across Los Angeles’ diverse Latina/o community, but can also be attributed to the fact that it is a truly community-based event in which members of the Latina/o community reclaim these spaces of civic and religious power themselves. By highlighting the visibility and centrality of the community within the core of the city’s civic and religious power, the production makes powerful critiques of this power while simultaneously reclaiming it, if only for a few nights. (1) Navarro, Mireya. “Guadalupe Spreads her Theatrical Wings.” New York Times 12, Dec. 2007, Theater. (2) The Nican Mopohuan written completely in Nahuatl in 1640 is considered the primary record of the apparition of the Virgin Mary as Our Lady of Guadalupe to Juan Diego in 1531. (4) This paper is an excerpt of a chapter of my dissertation which specifically looks at various forms of Latina/o Theater and Performance which stage alternative and revisionist histories of Latina/o Los Angeles history. Americas. Durham and London: Duke University Press, 2003, 29. (6) In Aztec mythology, Tonantzín is the Mother Goddess and lunar diety. It is believed that Our Lady of Guadalupe is a syncretic, Christianized version of Tonantzín,. (7) Within Roman Catholicism, the altar is the most important feature within the church. The altar not only represents Christ, who is regarded as the cornerstone of the church, but most importantly it represents the table of the Last Supper and therefore is the site where the moment of Transubstantiation, the moment where the bread and wine become the body and blood of Christ, takes place. (9) Leclerc, Gustavo, Raúl Villa, Michael J. Dear Eds. La vida latina en L.A. urban Latino cultures. Thousand Oaks, Calif.: SAGE Publications, 1999. 7. (10) Navarro, Mireya. “Guadalupe Spreads her Theatrical Wings.” New York Times 12, Dec. 2007, Theater. (11) “Archdiocese of Los Angeles.” Profile of Cardinal Mahoney. 15 April 2008. (12) Card. Mahoney, Roger. La Virgen de Guadalupe, Dios Inantzín. Play Program. 7 December 2006.